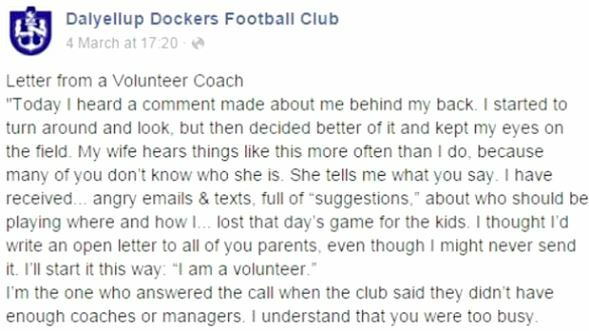 "I coach your child's junior footy team—you were too busy, so don't knock me." This article appeared in a local paper, and as the Facebook page has since been taken down, I'm reprinting it here. It is truly good! This open, unidentified letter is to parents and friends who criticize safely from the sidelines. The writer, a junior football coach, decided in his or her frustration to remind them that he/she was the one who stepped up when they didn't. The coach's heartfelt expression received immediate online support and started to go viral within a few days. The letter firmly reminds us all that when it comes to volunteering, including for youngsters' sports, it is through the personal sacrifices of these willing volunteers, their love of the sport, their kids and the wider community, that sporting competitions prosper. That's the start of the letter. Photo is from Facebook. Club president Neville Walsh said the letter was from a blog which posted elsewhere in 2010. "We thought the strong messages within this article inspired people to become involved rather than critical of volunteer club coaches." However, despite the letter's age it still seemed to resonate strongly with other coaches and parents and the post has since been shared more than 400 times and received more than 1300 likes. The unidentified junior coach began his letter "I am a volunteer". "I'm the one who answered the call when the club said they didn't have enough coaches or managers. I understand that you were too busy," the letter continues. "I have some news for you. I'm not retired. I'm busy too. I have other children and a job, just like you do. "Not only do I not get paid to do this – it costs me money. "I see you walk up to the game 15 minutes after it started, still dressed for work. Do you know I've already been here over an hour? "Imagine if you had to leave work early nearly every day. "I've never seen you at a training. I'm sure you're plugging away at the office. But I'm out here, on the field, trying my best to teach these children how to play a sport they love. "I know. I make mistakes. In fact, maybe I'm not even that great a coach. But I treat the kids fairly and with respect. "I am pretty sure they like coming to my trainings and games, and without me or someone like me, there would be no team. The letter continues to highlight the effort put in by the volunteer coach and hits back at the 'sideline critics' who don't hang around to help pack up after games are finished. "I'm part of this community too and it's no picnic being out here on a stage like this. It's a lot easier back there with the other parents where no one is second-guessing you. "After the game is over, I'll be the last one to leave. I have to clear the pitch, put away all the equipment and make sure everyone has had a parent arrive to pick them up. "I'm sure you've already had dinner and are relaxing on the couch by the time I finally kick the mud off my shoes and climb into my car. "Do you know how nice it would be if, just once, after a game one of you offered to carry the heavy gear bag to my car or help collect the balls, bibs or bottles?" However, the letter writer says they don't mean to sound bitter and finishes by asking other parents to "put their hand up" and help out their junior club. "If I sound angry, I'm not. I do this because I love it. "There are plenty of rewards and I remind myself that while you're at the office working, your kid is saying something that makes us all laugh or brings a tear to my eye. "I just wish sometime those who don't choose to volunteer their time would leave the coaching to the few of us who do. "Please feel free to put up your hand and help your club." Other junior coaches and and parents were quick to praise the letter writer and offer him their support. "Well written and it's not just football - any volunteer coaching or mentoring positions are so hard to fill and some people need to stop and appreciate what others do for others. Thank you for this letter," commented Jenaya Bell. "No one wants to volunteer and teams are folding, not for lack of players, but lack of club officials and coaches. Support those individuals that offer their services; your kids will be better adults for having committed to a sport or team as a child and understand the value of commitment," Cathy Baker said. "It is rare to find a good parent group. 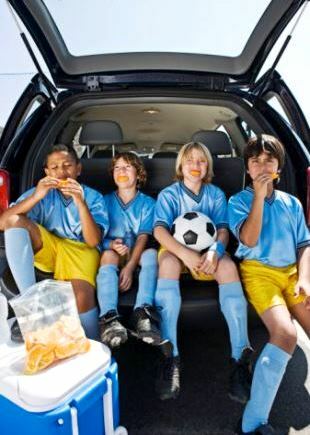 My husband and I coached soccer for many years and we had developed good relationships with most parents. There are knockers and their words hurt — focus on the good that you are doing for those children," Kyle Sheedy added. "Definitely well said, but there will be some that like this status (someone else doing the coaching) that do bugger-all themselves. They con themselves they have a valid excuse and will happily watch the same half dozen people do all the work each year," said Mike Palfreyman.